(Phys.org)—Japan's resolve to come up with better wheelchairs for the disabled and aged for indoor and outdoor use has produced numerous prototypes showcased at special events. The latest debut is a robotic wheelchair that stages a kind of Transformer act, converting its wheels into legs when needed, as in climbing stairs. 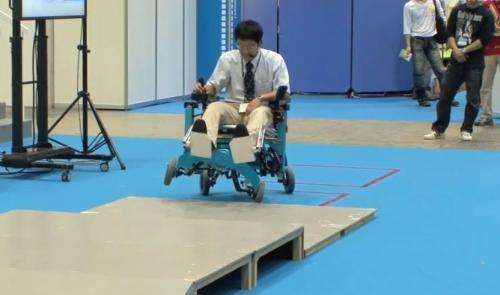 A group from the Chiba Institute of Technology, led by associate professor Shuro Nakajima, developed the wheelchair. The device has a four-wheel drive and five axes. The chair rolls along on its wheels, until it reaches an obstacle such as steps or a ditch. The chair meets the obstacle by using wheels as legs. Sensors run the show; the sensors help the device to assess size and distance. The robot, with sensors on its feet, moves appropriately. If the sensors are ever in error, and the wheels hit an obstacle, the wheel torque can vary as a back-up measure. The device has a joystick so that the user can tell the chair in which direction the chair needs to go. The Chiba chair has other features for delivering practical assistance. When moving on uneven ground, there are controls to ensure the seat stays level. Also, in a tight spot, when the chair needs to turn around, the robot can line up its wheels and extend stabilizers on each side, enabling it to circle around. "For now, we're presenting this system and form as a concept," said Prof. Nakajima. He said the motion has mostly been worked out, so the team decided it was at a stage where they could show this robot to the world. "In the next phase," he said, "we'll get a variety of people to try it, so we can fine-tune the user experience." Optimizing a wheelchair for more practical use has been his research focus for some years. He authored studies, including "Mobile Platform with Leg-Wheel Mechanism for Practical Use" and "Development of Four-wheel-type Mobile Robot for Rough Terrain and Verification of Its Fundamental Capability of Moving on Rough Terrain." In both papers, he noted that a reason for his focus is the strong demand for mobile robots that can move on rough terrains to aid people who have difficulty in walking, for transportation purposes at disaster sites, for performing tasks outdoors, and in the construction industry. "However, there are few robots that are suitable for use in rough terrains," he wrote. But seriously: why does everything have to be a weapons platform? It's sort of sad to see (and makes me ashamed for the human species) that that is the first thing people think of when they see new technology. Many new concepts are first developed by military, because they can shovel money to projects that private companies would find otherwise too expensive. And later the price can get competitive to enter consumer markets. It just human nature to try to gain the upper hand in combat even at ridiculous prices. Just consider the price of atomic weapons: Two used, how many has been build?